By buying this product you can collect up to 3788 bonuspoints. Vagnsset med 5 personvagnar 'D 182' typ DB, totallängd över buffertar 684 mm, epok III. Prototype: 5 express train passenger cars as train consist D 182 Hannover Cologne in Era III. German Federal Railroad (DB) type Düe (Pw4ü-37) baggage car, one type Büe (C4ü-28) coach, 2nd class, one type WRü(e) dining car, one type ABüe (BC4ü-39) coach, 1st/2nd class, and one type Büe (C4ü-38) coach, 2nd class. The cars look as they did around 1966. All of the cars have a close coupler mechanism. Lighting kits can be installed in the cars. The dining car has lighted table lamps. The cars are individually packaged and marked. Total length over the buffers 684 mm / 26-15/16'. 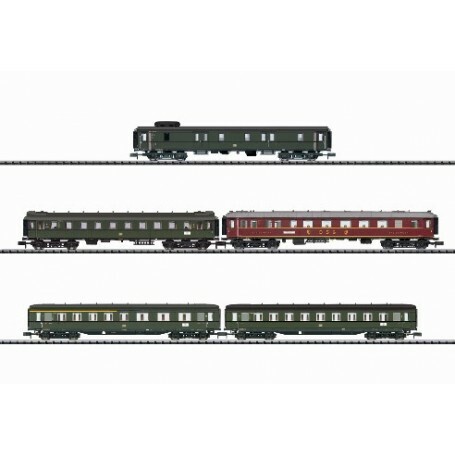 The locomotive to go with this set is the steam locomotive, road number 18 505, available under item number 16185.